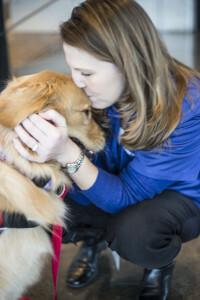 Two nonprofit organization in Atlanta, Paws for Life and Atlanta Pet Partners, certify therapy animals that bring joy to patients, doctors, nurses and students. Pet Partners, a national organization, runs on volunteer work from pet owners and therapy animals. Dan Barnhill, founding director of the Atlanta chapter, wanted to ease the stress that people often experience while in the hospital. Therapy animals create an environment where pain or stress is eliminated by the joy that the animal delivers. In 2011, Atlanta Pet Partners got their national ids. Today, there are 65 teams of Pet Partners in the city. The team of volunteers travels to various hospitals like Emory, schools and mental health programs in Atlanta. A small act of kindness brought tears to a cardiologist in critical condition after having a heart attack. Barnhill and his companion Peoples, a 6-year-old Staffordshire bull terrier rescued out of Anniston Alabama, visited the Emory Midtown ICU on many occasions but this moment was one that he remembers the most. In 2008, Barnhill was hospitalized for 15 days, and the journey to recovery had many obstacles. While recovering, his doctor suggested that he find a hobby. His love for animals fueled a passion for giving back to the community. “I wanted to join a group that gave back, a group that was national, not homegrown, that has rules and procedure with a good structure for the healthcare industry,” Barnhill said. When Barnhill found out about Pet Partners, he knew that it was the right organization. Barnhill and Peoples started a new journey. After taking the proper courses, the team passed evaluations and Peoples became a certified therapy dog. Therapy animals work for free hugs and affection. When the animals are working, they enjoy playing catch, taking naps with patients, backrubs and being petted. The therapy animals are trained to help patients in many aspects, such as occupational therapy. With the assistance of an occupational therapist, the patient interacts with the animals to help them regain strength, memory recovery and speak. As stroke patients gain one-on-one therapy. Barnhill notices that the recovery process is faster when animals are incorporated. Pet Partners provide animal learning, animal assisted activity, and animal assisted therapy. Barnhill and Peoples frequently visit Emory Hospital to greet patients, doctors, and nurses. Animal lover and rescuer, Kimberly Brenowitz is the founder and president of Animals Deserve Better. After rescuing animals from kill shelters, Brenowitz wanted to start an organization that saved lives for humans and animals. In collaboration with Pet Partners, organizations like Animals Deserve Better, are dedicated to making life easier for both animals and humans. Paws for Life is a program facilitated by Animals deserve better, which provides animals for people who need to be assisted through therapy or service dogs. Paws for Life takes rescues animals from high kill shelters and trains them to be adoptable pets and service dogs. 30 percent of the dogs are trained to be service animals and the rest of the animals get adopted, according to the organization’s website. “We rescue pregnant dogs and orphaned puppies from high kill shelters, those with the ability to become service dogs, and the other pups are adopted to loving families,” Brenowitz said. The Paws for Life therapy team is dependent on volunteer work, and the organization has 21 animal therapy teams. Handlers and their certified canine travel around visiting schools, Children’s Hospital, therapy and psychiatric practices. Animals Deserve Better, uses the Pet Partners program to test their therapy animals. The intensive training can take anywhere between six to eight months. The main thing that sets Paws for Life apart from other organizations is their dedication to provided life-long partnerships with animals and humans. While service and therapy canines both provide assistance, there are differences between the duties performed by each dog. Paws for Life provides service dogs to people who desire canine assistance with their everyday lives, and therapy animals for emotional or physical support. The main distinguishing characteristic between service and therapy dogs is the training. Therapy dogs are trained to provide emotional support, and their focus is to provide psychological or physiological treatment. Therapy animals visit schools, businesses, hospices, nursing homes, and other healthcare facilities. When working therapy dogs are allowed to socialize, and their greatest strength is providing endless championship. 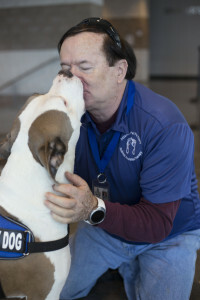 “Their primary roles are to provide their disabled owners with emotional comfort providing the basic gift of companionship and unconditional affection,” Brenowitz said. Service dogs go through intensive training to help them detect when their handler has a medical emergency. A diabetic alert dog, trained by Paws for Life, detects changes in blood sugar levels. Once the proper balance changes the dog then alerts the handler. These dogs assist with autism, medical alerts, PTSD, hearing, seizures and more. Happy Tails Pet Therapy is another animal therapy organization located in Atlanta. 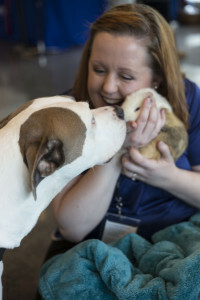 Volunteers openly share their pets with others, while visiting people patients in the hospital, and other businesses that requests their services. Happy Tails animal therapy brings positive energy and fun to the people who are going through tough emotional and physical battles. The therapy is designed to improve cognitive skills, memory, speech and communication, coordination, mental health, and relaxation. Simple activities such as petting or brushing an animal help alleviate stress to relax a patient. For more information about Happy Tails Pet Therapy visit the organization’s website. Therapy animals need to be interactive and comfortable with human touch. According to Atlanta Pet Partners, there are a few things consider before taking the animal therapy evaluation. Here are a few qualifications. The evaluation has a 22-part skills and aptitude test, that gradually increases the stress on the animal. As the animal goes through the evaluation, the pet owner has to show confidence while giving commands. -Trained and knowledgeable on basic obedience commands. *Pet owners have to take an intensive workshop before the animal can take therapy evaluations. *For information about volunteering and therapy animals visit the Atlanta Pet Partners website. *Additional information about service and therapy dogs are located in the Animals Deserve Better website.